Big Finish’s recent foray into the worlds of ‘New Who’ continues with an exploration of one of the most central and yet also still one of the most enigmatic characters- River Song. Since her debut/finale in 2008’s ‘Silence in the Library’/’Forest of the Dead,’ River has flitted onto and off of our screens, becoming most prevalent alongside Matt Smith’s Eleventh Doctor but bleeding through into the adjoining regenerations as well. Stealing nearly every scene she has been in with her knowledge, wit, charm, and cheek, and hinting at so many untelevised adventures along the way, Big Finish now gives us a chance to better get to know River and to see some of those adventures when not in the presence of the Doctor. The first story in this four-part box set, ‘The Boundless Sea’ carries with it the necessity of setting up the overreaching story arc, and for the most part it succeeds wonderfully. One of the aspects we so rarely get to see on screen is the fact that River Song is an archaeologist, and so it is only fitting that the introductory story would focus on that chosen vocation. With as much charismas as Alex Kingston brings to the role, there will inevitably be comparisons to Indiana Jones, but that can only be a positive. Knowing so little about such lengthy periods of River’s actual past, the written characterization in this story is a bit different than that shown on screen. Here we find her immersed in archaeology but seemingly a bit reticent and impatient; however, the joyful energy that Kingston exudes never lets these potentially negative attributes become overwhelming to the point of detracting from the enjoyment and progression of the narrative. It should also be noted that Alexander Vlahos as the impromptu companion Bertie Potts is absolutely superb. The two play off of each other wonderfully right from the start. The plot, focusing on a mutation that affects those that explore a certain burial site, ends up not fully living up to its potential, but there are so many other factors in play that lift the overall experience tremendously. Aside from the standout performances, the music and overall sound quality are outstanding. A lot of emotion is imbued into the latter third of the story, and the pieces are all set up very well for the remaining three stories. Not overburdened by continuity, and yet still fitting in some great callbacks to previously televised adventures, ‘The Boundless Sea’ is a great ‘re’-introduction to the character of River Song. The characterization of River is much more on par with the one we have come to know, willing to right a wrong at all costs with her trademark quips and unerring sense of justice. Overall, though, this story is very much a filler piece- albeit one with very high-concept moral and ethical discussions- to set up the final two acts of this set. ‘Signs,’ as the third part of this set, is easily the most unique of the bunch. Essentially a two-hander between River and the man known to her as the Doctor (played by the excellent Samuel West), this story revolves around apparent recurring memory loss, a debilitating illness, and Spore ships that are destroying entire civilizations. With these factors never too far from the forefront, ‘Signs’ allows for a lot of genuinely emotional and sometimes heartbreaking conversations between the two leads. A lot of parallels will be drawn between this story and Steven Moffatt’s televised ‘Heaven Sent,’ and for good reason, but the crux of that episode has been masterfully re-imagined in this story to allow for some truly fantastic storytelling. The plot requires some concentration to follow as it jumps back and forth quite a bit, but the end result and the eventual plot reveals make that bit of effort very worthwhile. Lastly comes the moment teased for so long before this boxset’s release as Paul McGann’s Doctor crosses paths with River Song in ‘The Rulers of the Universe.’ Of course, being ever conscious of the temporal rules, River realizes that she cannot directly cross paths with this incarnation of the man who will become her husband, leading to some fun- if not shrouded- conversations. McGann, as always, is utterly excellent as the Eighth Doctor, casually exuding charm and principle as he determinedly sets about the mission he finds himself taking part in currently. This is a Doctor that finds himself at the height of the Time War, struggling to pick up the pieces and avoid damage where possible, and that grim terseness he sometimes lets escape is completely in keeping with this incarnation at this point in his timeline. McGann could so easily have been the Time War incarnation given the huge range of emotions on display just when talking about the Time War and its effects already being felt. The story itself beautifully ties together the dangling plot threads from the previous stories. The Doctor finds himself coerced into helping the afore-mentioned ‘elite,’ with that group now attempting to control and monetize the Spore ships while dealing with some very ancient beings. It truly is the performances that stand out here, though. McGann rightfully deserves heaps of praise, but Kingston is absolutely on form here as her future husband is being manipulated and in need of her help. Likewise, Vlahos completes his range of characterizations as he progresses through this set from inept to highbrow to utterly criminal, a truly great progressive performance. 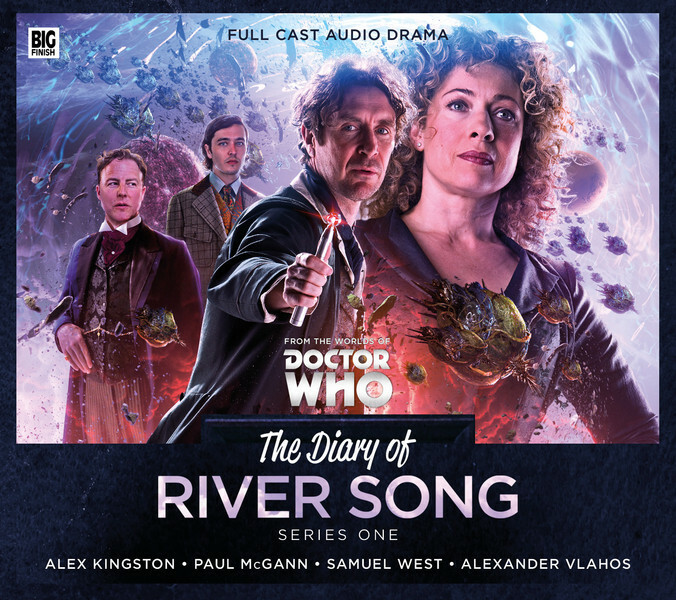 Overall, then, The Diary of River Song is a tremendous listen. Aside from a few pacing issues, the story flows seamlessly into a very satisfying conclusion that only serves to further whet the appetite for McGann’s and Kingston’s next appearance together in the upcoming Doom Coalition 2. Not relying on televised continuity and given the freedom to further flesh out the enigmatic and charismatic River Song, this boxset is truly a great addition to Big Finish’s Doctor Who spin-off ranges.